A Klee painting named “Angelus Novus” shows an angel looking as though he is about to move away from something he is fixedly contemplating. His eyes are staring, his mouth is open, his wings are spread. This is how one pictures the angel of history. His face is turned toward the past. Where we perceive a chain of events, he sees one single catastrophe which keeps piling wreckage upon wreckage and hurls it in front of his feet. The angel would like to stay, awaken the dead, and make whole what has been smashed. But a storm is blowing from Paradise; it has got caught in his wings with such violence that the angel can no longer close them. The storm irresistibly propels him into the future to which his back is turned, while the pile of debris before him grows skyward. This storm is what we call progress. Shoja Azari, “The Mourners” (still from “The King of Black”), 2013. HD colour video with sound, TRT 24 minutes. Courtesy of the artist and Leila Heller Gallery, New York. A man wishes to possess beauty. In his singular pursuit of an ideal, he pays no heed to warnings, takes no note of signs that point to an unhappy outcome. He eventually succumbs to despair and is forced to examine the extent of what he has lost in his pursuit of the impossible. It is a timeless tale of humankind’s battle between perception and reality. Plato’s struggle with the beguiling role of poets, Ghazali’s preoccupation with differentiating between science/logic and belief in defining falsafa (Arabic for philosophy), Kant’s desire to distinguish between the comprehension of knowledge and the perception of it; men across time and space have obsessed over the need to establish moral absolutes. As we stepped into the 21st century, however, multiculturalism, technological leaps and a shift in the very notions of time and space created a world in which distinctions between the real and the simulated became harder to establish. To look at a work of art such as The King of Black, a 24-minute film by Shoja Azari, is to be confronted by several such transformations of perception through the lens of a Persian legend. Azari did not simply depict the influences of his eastern heritage in The King of Black—rather, the story at hand seems to tackle a far more complex struggle with identity. It is almost as if the Iran-born, New York-based Azari decided to offer a representation of his own duality of existence within two times, two cultures, by looking at Nezami Ganjavi’s epic Haft Paykar—a text that has been pumping lifeblood into Central and Western Asia’s literary and cultural veins since it was produced in the 12th century. Iran today, Persia yesterday, Azari today, Bahram yesterday—all become part of a multifarious network of identities. In her essay “Time, History and Intermediation” on Azari’s The King of Black, Alexandra Keller identified how the work functions between several layers of culture by addressing Iran’s history as both “in place” and without, that is, a history captured by memories and therefore robbed of time, place, and accordingly, also context. Consequently, the work appears to be a projection of the artist’s own struggle to locate himself within the context of his past and distinguish it from an idyllic memory. Haft Paykar, known to the West as the story of Seven Beauties, explores the romance of King Bahram’s belief in fate, which is ultimately shattered by the realization that a man’s acts, and not providence, determine the course of his life. Azari’s ingenuity in weaving the rich fabric of one of the stories from Haft Paykar (Bahram’s quest to discover why people in his land are dressed in black, while attempting to court the Queen of Houris) through the use of both old and new threads—the use of miniature paintings, an ancient art practiced to document stories as painted illustrations, in conjunction with the use of film, a newer mode of record-keeping—can be seen as a way of bringing together the past and the present, while at the same time examining how each is both a part of the other, and not. 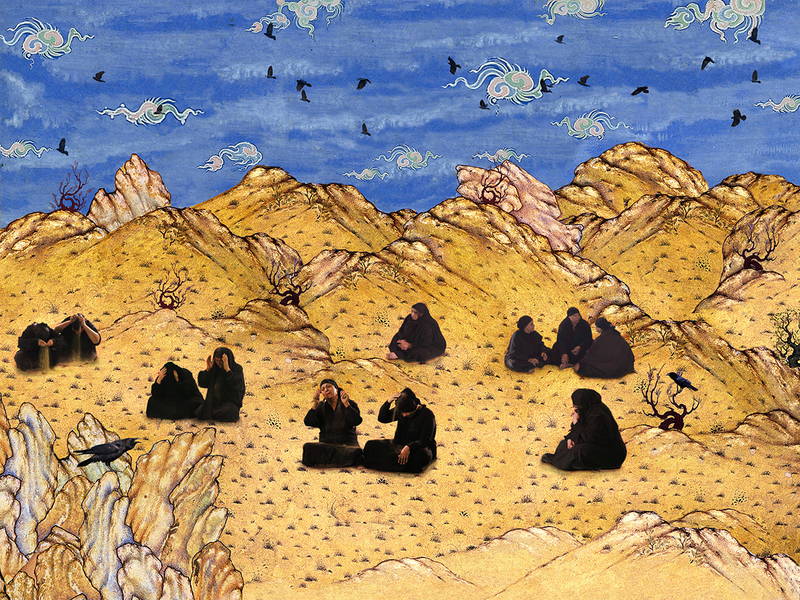 As Bahram walks through intricate architectural spaces, lush gardens and the golden desert, as he courts the Houris, and ultimately dons the black garb of desolation, one is struck by the way in which the animate Bahram exists within his inanimate, painted surroundings. How the background both supports and rejects him, how his flatness on film complements the flatness of miniatures, yet how he pales against the vividness of his environment, which, in turn, presents a stage-like backdrop to Bahram’s flesh-and-blood form. Azari’s creative use of mixed media highlights the many possibilities of storytelling in its many forms. From glorifying the past to reevaluating it in the context of the present or highlighting our own shortcomings in approaching it, Azari’s generous vision allows for it all in The King of Black. While growing up in Pakistan, the influences of Persian culture had a tremendous impact on my own experiences. From miniature paintings to carpets, from language to music, food and clothing: it is difficult to imagine how the region would look today without the Persian influences weaving through the Sub-Continental way of life. As Azari’s work lit up a dark corner of the Surviving Sandy, I was reminded that the artist’s work has, over the years, opened up a valuable way of looking at a vibrant culture, in a context unimpeded by the definition of the Orient. And that like New York, with its incredible resilience to overcome the Sandys of its time, artists like Azari inspire us to prevail over our own storms.